A few years ago I saw a nice presentation of Whitmore’s academic geneology (his advisor, his advisor’s advisor, and so forth). Sometime in 2011, I scraped wikipedia for most of my tree, but never ended up making it presentable. More recently Darcy showed me hers, so I finally got around to making a nice graph representation of my tree. With the help of Agnieszka, I added some of the other UCSD professors that we scraped from wikipedia and random websites. 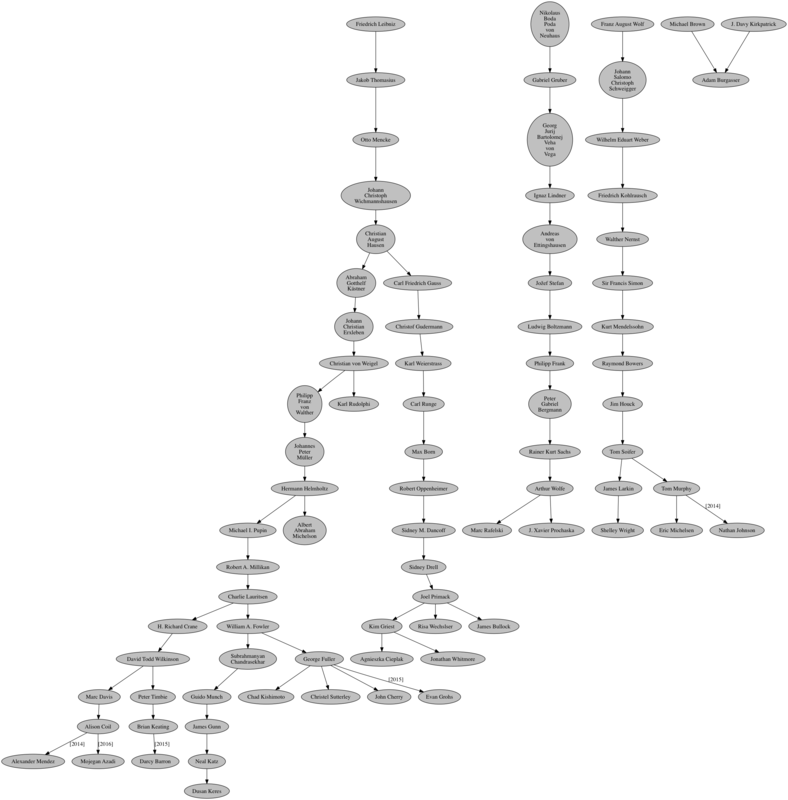 Here is a pretty simple directed graph of the lineage. I would like to add dates of PhDs, and universities, but for now it is just a nice presentation of the branching. After adding both Brian, Kim, and George I half expected that the the full academic tree space is qute small. Further adding Tom and Art suggested otherwise. By no means do I think this is a complete graph of these professors, and is merely what could be done in an hour. If you find any problems or issues let me know, or submit a pull request to the github.